Making gluten-free Linzer cookies wasn’t difficult – the basic flour mix does the job quite well with a few added grains – but moving the dough from one place to another after it had been cut was a pain in the a$$. I came up with a way to move the cookies without them turning into examples of non-Euclidean geometry, which you’ll find below. 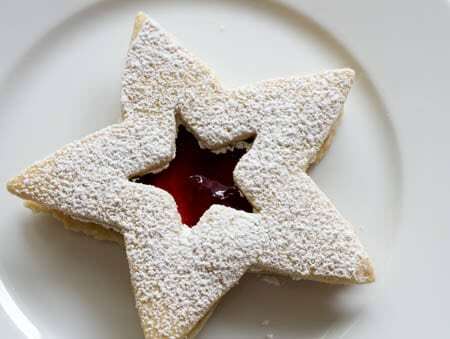 I opted to use star-shaped cookie cutters for my gluten-free Linzer cookies, because I’m obsessed with stars and collect them in every form that I can. These little stained glass-looking star cookies make me grin right down to a subatomic level, and just thinking about eating them later makes me as giddy as a kid on the day before winter break. You can (and should) try making them in a variety of sizes and shapes. Then comes back and show me what you’ve created! While the traditional jam flavor used for Linzer cookies is red or black currant, you can use any kind of jam for these cookies. For the ones in the photograph I used a very special jar of jam that I received from Rachel Saunders at Blue Chair Fruit Company, an artisan jam operation in Oakland, California. Rachel gifted me with this particularly enticing flavor: Black Plum Jam with Candied Citrus & Bay. Rachel combined Burgundy and Satsuma plums with hand-candied lemon and orange peel and freshly picked bay laurel. The result is a super-tart jam, complete with tiny bits of plum skins and bright citrus peel. Why am I mentioning this? I think that Rachel is doing amazingly creative things with jam, and I’d love to impart some of her creativity onto you, my dear reader. Experiment with your Linzer cookies, trying jams beyond the usual suspects of strawberry, raspberry, and boysenberry. I actually took a few Linzer shells and made a chocolate peanut butter Linzer cookie. Was it traditional? No way. Was it freaking delicious? You have no idea. Anyone who’s ever made dough cutouts with cookie cutters knows that it’s tough – nay, nearly impossible – to move cookie dough to a baking sheet once it’s been cut into shapes. Tender dough likes to bend and stretch, and what was once a teddy bear often looks like a circus acrobat after a car wreck by the time it gets to the cookie sheet. Gluten-free dough is even harder to work with. I’ve come up with a solution – roll your dough out onto a piece of parchment, cut out your shapes with cookie cutters, remove the excess dough to be re-rolled, and then cut the parchment around the cookies with a pair of scissors. 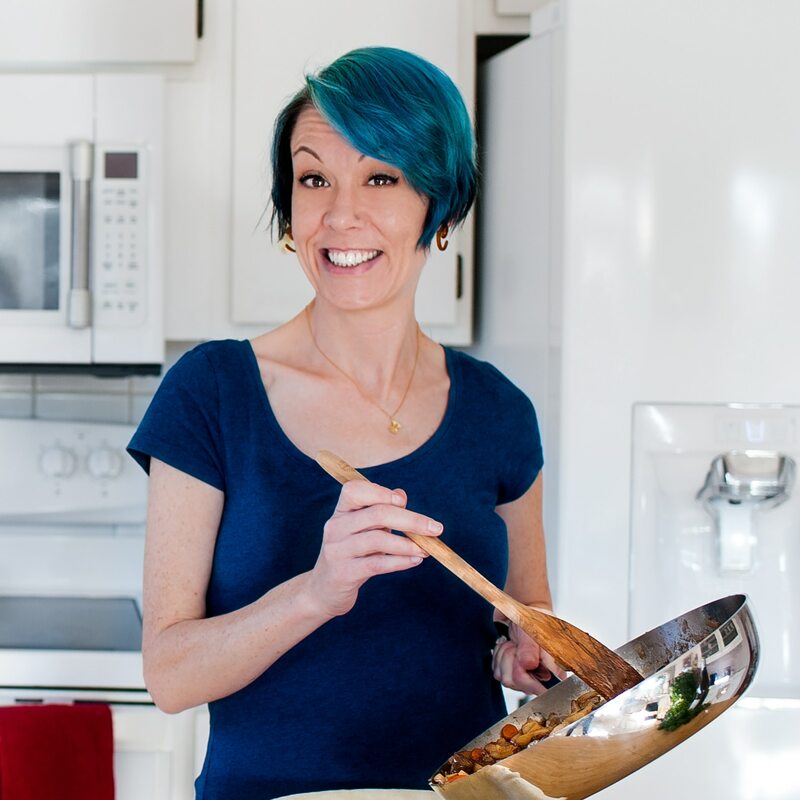 The cookies can then be moved without contorting into unrecognizable shapes, and since they’re on parchment, they won’t stick to the cookie sheet. You can even move the baked cookies with the parchment, leaving them on the paper until they’re completely cooled and not likely to bend or break. Success tastes good, doesn’t it? 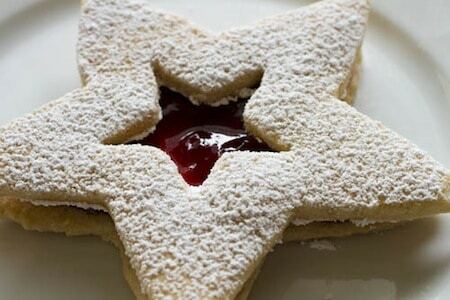 These little gluten-free linzer cookies are delicate and sweet, and their star-shape makes them irresistible. So buttery they might make Santa swoon. Makes 2 dozen cookies. Preheat oven to 325°F (162°C). Spread nut flour into a thin layer on a cookie sheet and roast for 15 minutes, giving it a good stir halfway through. With a stand mixer or electric hand beater, beat shortening, 2/3 cup powdered sugar, and xanthan gum until well mixed. Add eggs and vanilla, mixing until well incorporated. Add gluten free flour mix, sweet rice flour, nut flour, cinnamon, and salt. Beat until you've got a smooth dough. Roll dough out between two pieces of parchment until it is 1/2-inch thick and refrigerate for 1 hour. Remove dough from fridge and cut with cookie cutters. 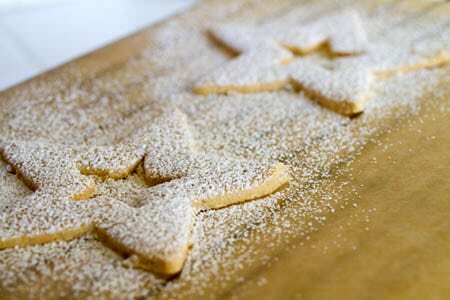 Remove the excess dough from between the cookies and cut the parchment around the cookies with a pair of scissors. 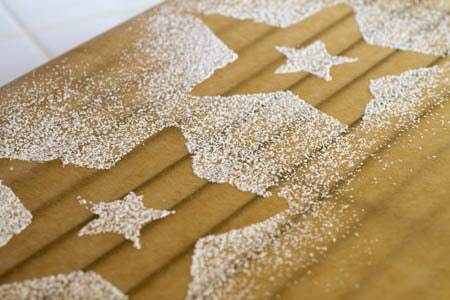 Gently move the cookies with their attached parchment to a cookie sheet. Use a smaller cookie cutter to cut out the centers of half of the cookies on the baking sheet – you will be sandwiching two cookies together and there will be a small cut out in the top cookie so you can see the jam underneath. Gently remove the inner shape with the tip of a small knife to keep from damaging the outer cookie. Place the baking sheet in the refrigerator to keep the cookies chilled. Repeat until you've used up all the dough. Once all the dough has been cut with cookie cutters and the shapes are arranged on a baking sheet, place the baking sheets in the refrigerator for 30 minutes. Preheat the oven to 325°F (162°C) while they are chilling. Bake cookies for 14 minutes, until they are very lightly golden. Remove from oven and allow to cool on pan for 5 minutes before moving the cookies, with their attached piece of parchment, to a cooling rack. Allow to cool fully. In a small saucepan, heat jam over a low heat to thicken it a bit. Remove any lumps from the jam and allow to cool. Place the cookies with the cutouts in the middle onto a wire rack and sprinkle generously with powdered sugar. Making your own hazelnut flour is easy. Just pulse the nuts a few times in the food processor until you've got a fine powder. Be careful of grinding too much or you will end up with nut butter! Nutritional analysis is based on using Bob's Red Mill G-F Baking Flour, it is used only for nutritional calculations. The analysis also excludes the jam for filling the cookies.